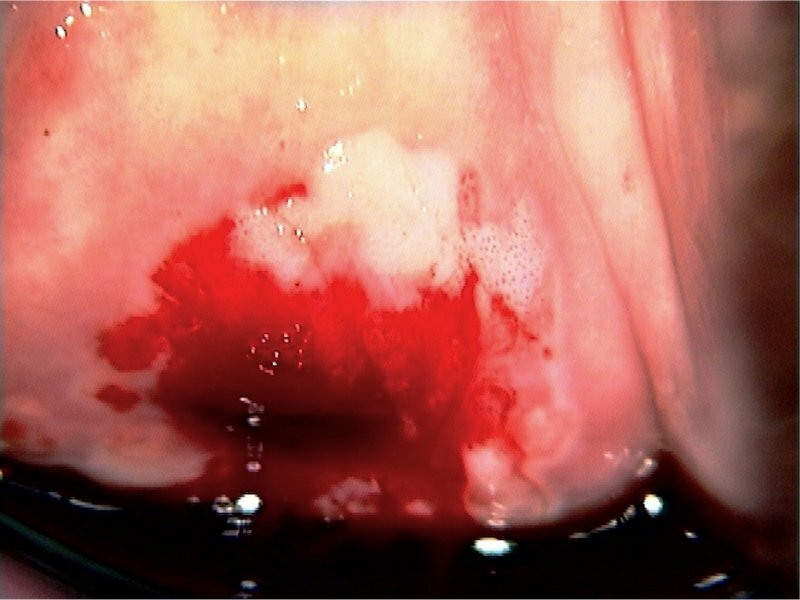 Coarse punctation: If the red dots are prominent, are raised from the surface, are irregularly spread, and bleed on contact, the punctations are called coarse punctations. Coarse punctations signify a high-grade lesion or cancer. Sharp border: A distinct and regular border signifies that the lesion may be neoplastic in origin. 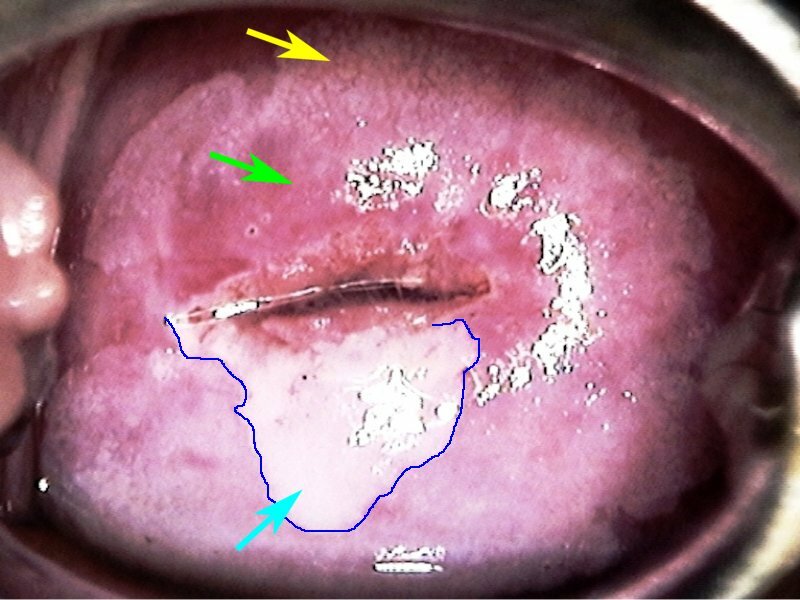 The border of the lesion may be raised from the surface in CIN3 or worse lesions. 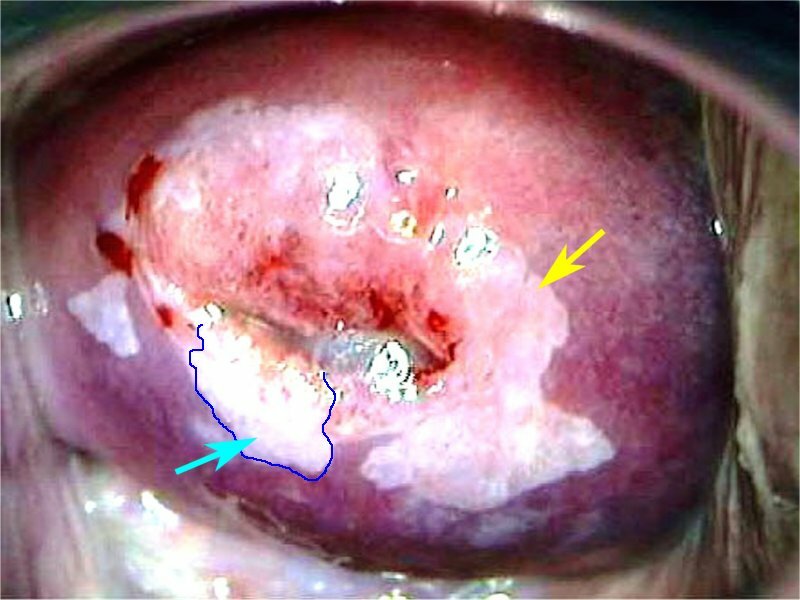 Inner border sign: Low-grade and high-grade lesions may coexist, and there may be internal margins (borders) because of the abrupt change in the nature of a lesion or lesions. 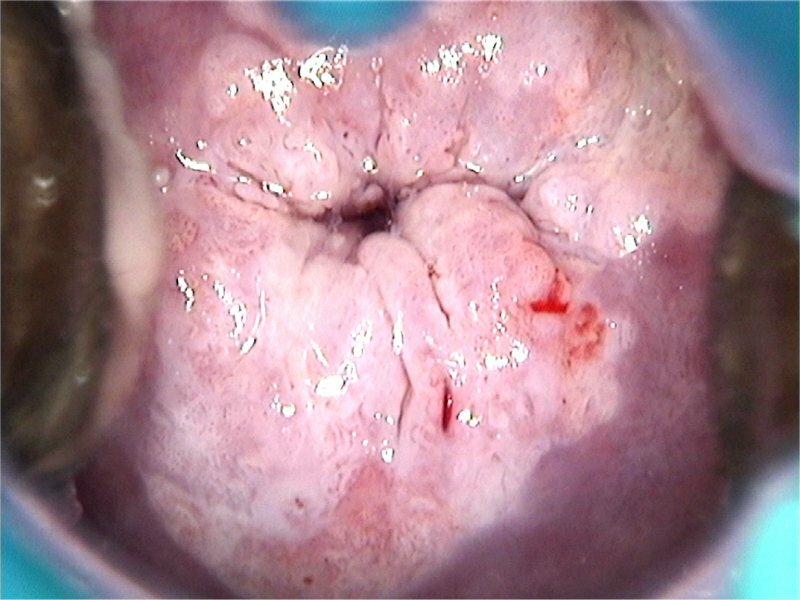 This is called a “lesion within a lesion” or the “inner border sign” and is a feature of high-grade neoplasia. The inner, more proximal lesion is more severe and of higher grade. Ridge sign: If the acetowhite area is thick and elevated and is projected near the SCJ like the top of a wall or ridge, this is called the “ridge sign”. 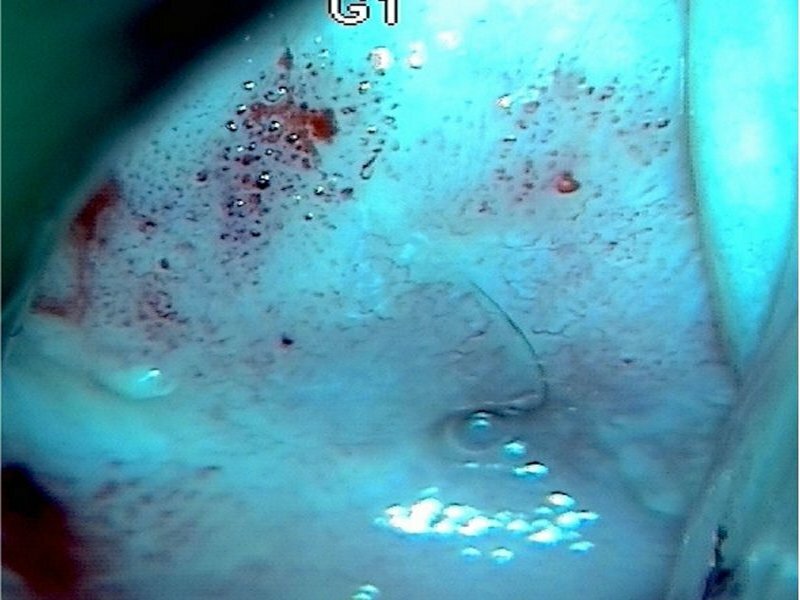 The ridge sign indicates the presence of a high-grade lesion. 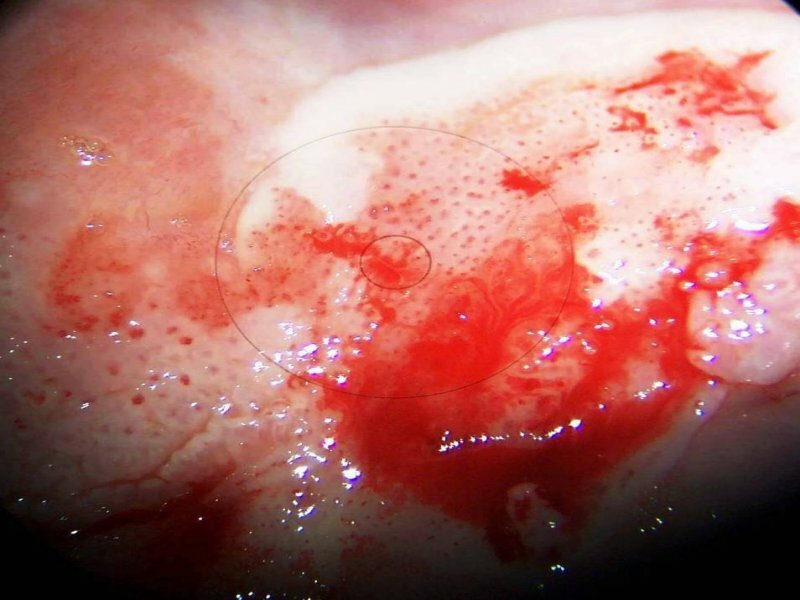 Rag sign: In high-grade lesions and invasive cancers, the epithelium tends to peel off easily. The eroded area is visible, and the peeled-off epithelium is seen to be hanging like rags. This phenomenon is usually iatrogenic, caused by overenthusiastic rubbing of the epithelium.